﻿ How to get to Maguk, Moline, Rockhole, Gubara, Motorcar Falls, Gunlom Falls and Koolpin Gorge. The name of Barramundi Gorge or also known as Barramundie Gorge in Kakadu National Park has been changed to Maguk in the southern end of Kakadu National Park around 4 hours from Darwin, the capital city of Darwin in Norrthern Territory Australia. Located an hour's drive south from Cooinda past the Cooinda turnoff in the South of the park on the Kakadu Highway, in World Heritage-listed Kakadu National Park, is Maguk a gorge within the Stone Country. A 14 kilometre four-wheel drive trip, followed by a one kilometre walk, leads to a beautiful natural plunge pool at the base of the steep gorge walls. Nearby is the Maguk bush camping area. After resting, take the short but moderatly difficult climb to the top of the waterfall where there sits crystal clear pools that are perfect for a refreshing dip. The panoramic view also makes the hike worth the effort, affording a panoramic view. Facilities BBQ Facilities Car park Picnic Area Public Telephone. App 1.15 hour from Cooinda to the Maguk carpark. Slow driving is recommended. Visited mainly by specialized soft adventure tour operators such as Adventure Tours, Gecko Canoeing, ATA, Connections Safaris, Wayoutback Safaris, Gagudju Dreaming Tours. You can see a selection of the tours to Maguk at www.australia4tours.com. 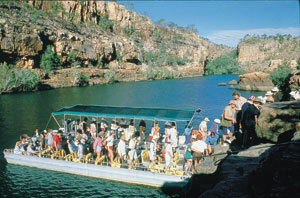 Maguk or Barramundi Gorge is usually visted in the afternoon after folks visit Jim Jim Falls. This can be a very long day. Maguk Gorge or Barramundi Gorge in Kakadu National Park, Northern Territory Australia is most likely one of the most travelled to destinations of our four wheel drive rental selfdrive clients. 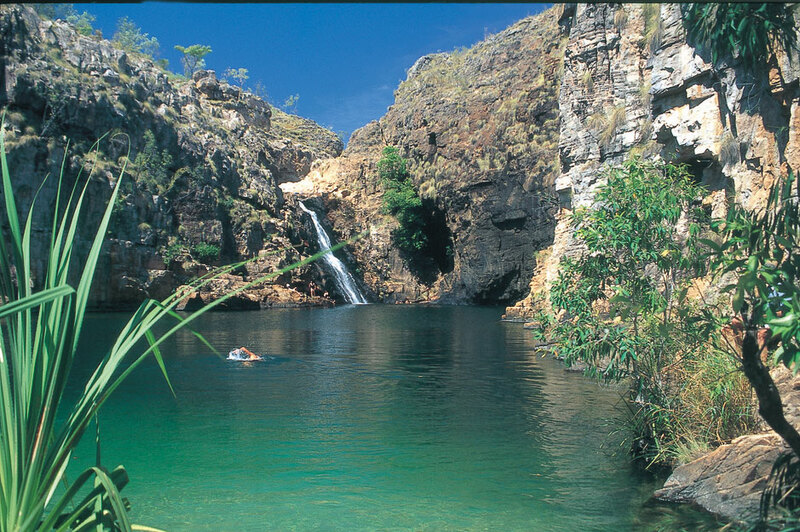 Compared to Twin falls and Jim Jim Falls selfdrive routes Maguk or Barramundi Gorge is compartively easier. Choices for 4wd rental vehicles for this route are the Britz wagon 4x4, Britz Safari, Hitop Bushcamper, especially the Britz Safari, TB Rooftop tent 4WD, hire selfdrive vehicles. Also the Apollo and Cheapa's Hilux Adventure. You can see all these 4WD vehicles for hire at Australia 4 Wheel Drive Rentals. Maguk Kakadu blog: I just did a search of Google and the first 7 choices all had the same paragraph on Maguk. Hopefully this is a much more informative blog to guide you. Sept 9th, 2007 my wife and I took a one day tour to Jim Jim and Twin Falls. But the crossing at Twin Falls was to deep so the guide opted for Maguk Gorge also known as Barramundi Gorge. Being a local I can only remember the name - Barramundie Gorge. Anyway the road in was actually not to bad for September. It was all 4X4 driving but rather well maintained - I know though it is under water a fair bit of the time in the Tropical Summer season November late to early March. I noticed there wasn't a toilet at Maguk so just to let you know. The walk was very relaxing for the first part as you can see. 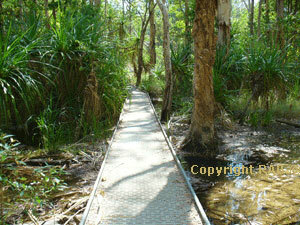 The boardwalk was my favourite and the surrounding flora was well engulfing. Signage as always blended in to the landscape but was quite visbale and very clear directions. I noticed it was mostly tour companies not many. The boardwalk finished and the path began to become sandy. Not sure whether it was better with or without sandals. Visiting Gunlom Waterfall Creek in Kakadu Australia Gunlom, located on Waterfall Creek in World Heritage-listed Kakadu National Park, is the magical combination of waterfall and serene plunge pool, with shady gums cooling the picnic areas. 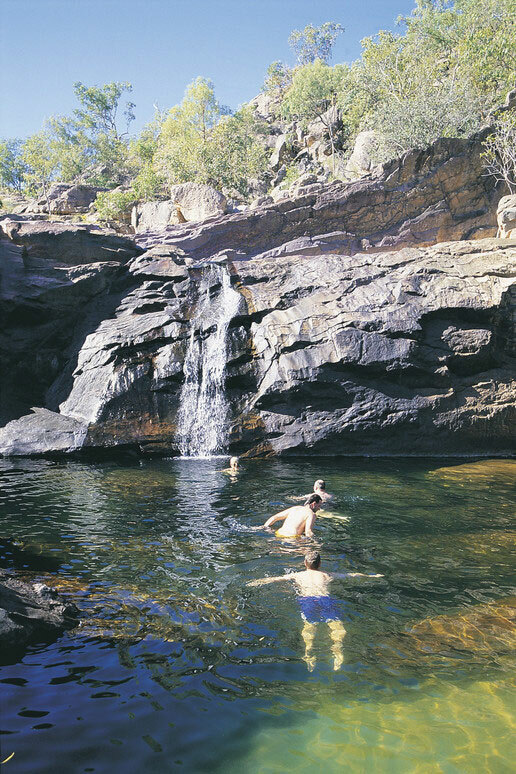 A steep climb to the top of the waterfall provides sweeping views of the southern-most parts of Kakadu National Park while you enjoy a relaxing dip in the crystal clear pools. A steep lookout walk leads to rock pools and views of the southern hills and ridges. The flat, easy walk to Murrill Billabong is great for bird watching, as is the short walk to the main pool below the seasonal waterfall. There is a grassed, shady picnic area and camping facilities include solar-powered hot showers. 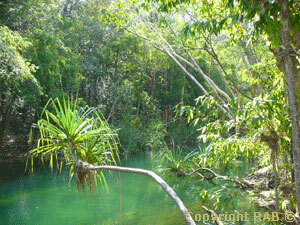 Gunlom is part of Waterfall Creek, one of the major tributaries of the upper South Alligator River. This is the only large tropical river system in the world to be entirely protected within a national park and a World Heritage Area. The Jawoyn traditional land owners and Parks Australia hope you enjoy your stay at Gunlom. Grade: Difficult climb, marked track. Actually the repected book 'Take A Walk' grades this as 'Hard'. This short climb to the top of the escarpment is rather steep in my opinion. Though once there the views across the lands from the Gunlom lookout make it all worth the effort. A series of tranquil clear rock pools where you can relax away from the camping area at the bottom. Grade: Difficult climb, marked track. 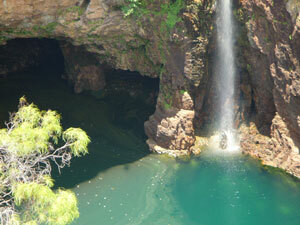 Features: A network of walking tracks which take in the plunge pools and wet season waterfalls of the Marrawal Plateau. Access: 2WD, camping permits required. Carry a topographic map on longer walks. Features: A scenic drive to a shady picnic area by the South Alligator River. Access: 4WD only, day use only. Features: A rest stop with picnic tables and toilets, lookout and short walk. Access: 2WD, day use only. Access: 4WD recommended. Camping area. 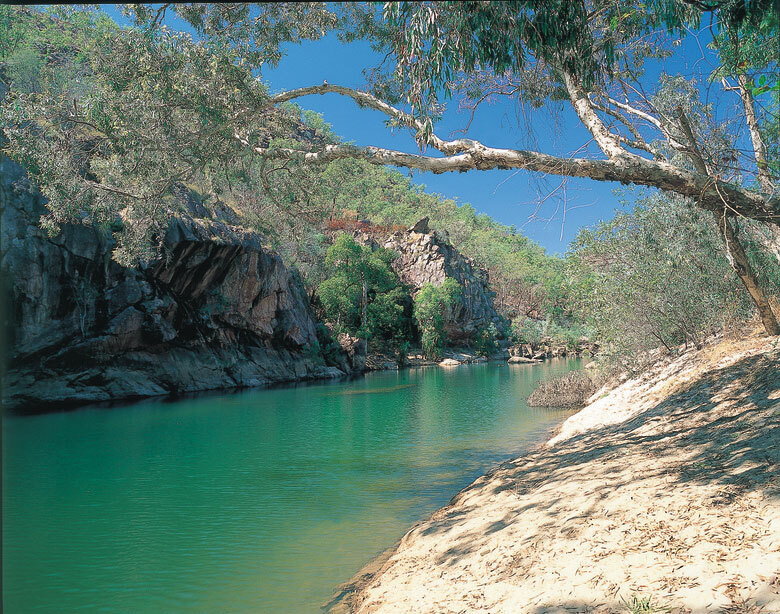 Jarrangbarnmi - Koolpin Gorge is located in World Heritage-listed Kakadu National Park. 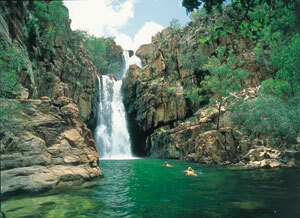 Jarrangbarnmi also known as Koolpin Gorge is in the south east corner of Kakadu National Park. You turn off the Kakadu Highway at the sign posted turn off to Gunlom Falls, up from the southern entry to Kakadu and 11km from the Wirnwirnmila (Mary River Roadhouse) not to be confused with the Mary River off the Arnhem Highway. 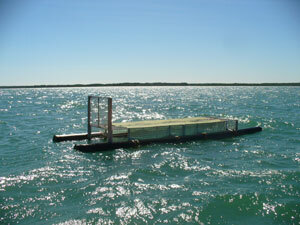 (approx 89 km south-east from Cooinda Gagudju Resort and Yellow Water Cruise platform or app 149 km from the township of Jabiru. Approx 26.5 km down this 4WD track you get to an intersection Gunlom Falls (turn left) and Gimbat Picnic day use area (turn right). Here you turn left for Gunlom Falls approx 10klm on the left and right for Jarrangbarnmi - Koolpin Gorge Campground area. At app the 10 klm mark is the locked gate on the left which signposted turn off to Koolpin Gorge (see below for permits and access). further on you app 7klm come to Gimbat Picnic day use area. Jarrangbarnmi (Koolpin Gorge) is a restricted access area under the Environment, Protection and Biodiversity Conservations Regulations 2000 and a permit is required to enter this visitor site. Access is available only with a high clearance 4WD and only during the dry season.There is a limit of 40 people who are allowed to use the area at any one time and both independent travellers and tour operators have the opportunity to access the site. Permits are required for visitors wishing to enter the area for day use only and also for overnight camping. 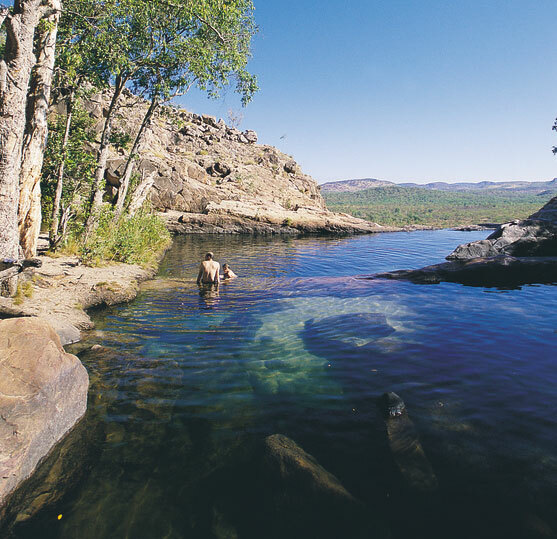 Camping safaris to Jarrangbarnmi (Koolpin Gorge) in Kakadu Jarrangbarnmi (Koolpin Gorge) is visited by specialized soft adventure tour operators with permits such as Gecko Canoeing, Wilderness Adventures and Odyssesy. You can see a selection of the Camping tours to other gorges though only private charters can go to Koolpin Gorge at www.australia4tours.com. 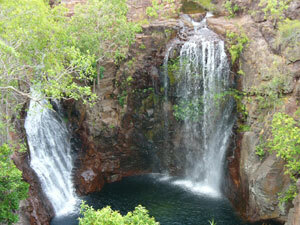 Self Drive Rentals and Hire to Jarrangbarnmi (Koolpin Gorge) in Kakadu Pational Park - permit required. Jarrangbarnmi - Koolpin Gorge in Kakadu National Park, Northern Territory Australia is most likely one of the least most travelled to destinations of our four wheel drive rental selfdrive clients. Though worth while if you take the time to obtain the correct information and permits. Choices for 4wd rental vehicles for this route are the Britz PMFR, Britz Safari, Britz Challenger, especially the Britz Safari hire selfdrive vehicles. 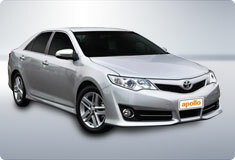 Also the Apollo and Cheapa's Hilux Adventurer 4WD vehicles for hire at Australia 4 Wheel Drive Rentals. Access to Jarrangbarnmi (Koolpin Gorge) Application form Phone enquiries: +61 (0) 8 8938 1140 E-mail enquiries: kakadu.permits@environment.gov.au About this permit Jarrangbarnmi (Koolpin Gorge) is a restricted access area under the Environment, Protection and Biodiversity Conservations Regulations 2000 and a permit is required to enter this visitor site. Access is available only with a high clearance 4WD and only during the dry season. There is a limit of 40 people who are allowed to use the area at any one time and both independent travellers and tour operators have the opportunity to access the site. Permits are required for visitors wishing to enter the area for day use only and also for overnight camping. Applications for permits must be submitted seven days in advance of the time you wish to enter the area. These can only be processed from Monday to Friday, between the hours of 9:00am until 4:00pm. Permit applications will not be processed on weekends or public holidays. Visiting Facilities at Koolpin Gorge Campground in Kakadu National Park � A car park/camping area adjacent to the downstream end of the gorge � A toilet adjacent to the car park � Fire rings/fire places - all fires must be contained within these areas � Generators are not permitted in the area. Visitors Must Not Enter Sacred Site restricted Areas Visitors must not go ashore on the creek bank opposite the camping area. Refer to the signs on site. This is a sacred site and entry is prohibited under the Environment, Protection and Biodiversity Conservation Regulations 2000, specifically under Regulation 12.23. Entering a prohibited area under Regulation 12.23 carries a maximum penalty of $5,500. Visitors to the area must keep to the creek line. Some places away from the creek are important cultural sites and can only be visited by Jawoyn who have the authority to go there. Please show respect for the views of traditional owners in relation to these significant areas. Copyright and Courtesy of Parks NT. 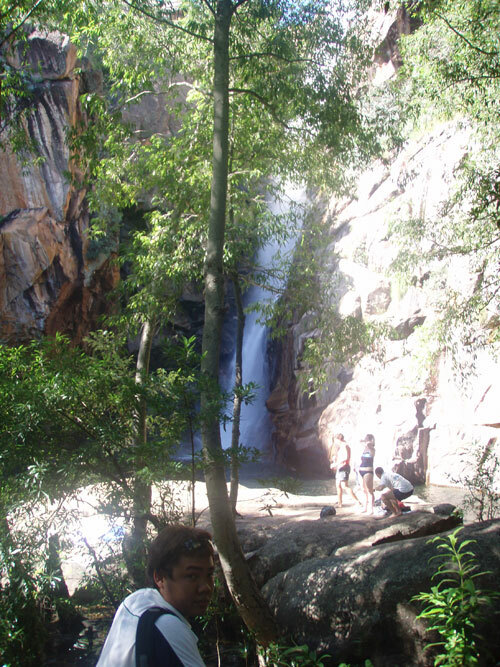 Features: Rock pools at the top of the falls and superb views Distance: 1 km return Grade: Difficult climb, marked track. Features: A network of walking tracks which take in the plunge pools and wet season waterfalls of the Marrawal Plateau. Access: 2WD, camping permits required. Carry a topographic map on longer walks. 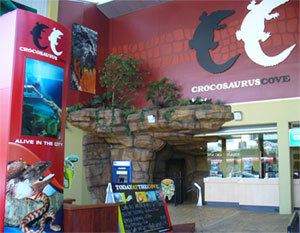 Features: A scenic drive to a shady picnic area by the South Alligator River. Access: 4WD only, day use only. Features: A rest stop with picnic tables and toilets, lookout and short walk. Access: 2WD, camping area. Features: A lookout with superb escarpment views and a shady picnic area Access: 2WD, day use only. 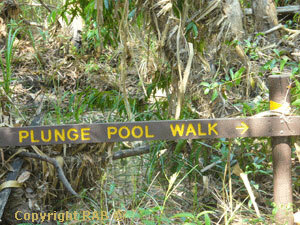 Features: A plunge pool and small waterfall Access: 4WD recommended. Camping area. The dry season which is approximatley which is classed generally as May - October each year.Though in current year the wet has not set in till late December or January and then finishes mid April. The dry season which is approximatley which is classed generally as May - October each year. Though in current year the wet has not set in till late December or January and then finishes mid April. Are there certain times of the year that I can�t swim? Salt and freshwater crocodiles are found in most Top End billabongs and rivers, and are occasionally seen on remote beaches. The accessible rivers and billabongs are generally sign-posted if saltwater crocodiles are known to inhabit the area, but if you are not sure, don�t swim. Swim only where recommended and always observe and read the crocodile warning signs. Aren�t swimming spots hard to get to or only acesible as part of a tour? All the swimming spots in Darwin, Litchfield National Park, Katherine, Mataranka and the MacDonnell Ranges are accessible by self-drive. A few locations are only accessible by four wheel-drive, such as Butterfly Gorge Nature Park and Tjaynera Falls in Litchfield National Park. Tour operators with swimming options include Adventure Tours Australia, Australian Pacific Touring, Connections Safaris, Odyssey Tours and Safaris and many more'. Emergency call devices: Emergency call devices are to be used in emergencies only. Follow the instructions located on the devices. 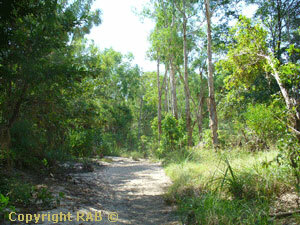 Jarrangbarnmi is located in a remote area of Kakadu. Mobile phone reception is not available. 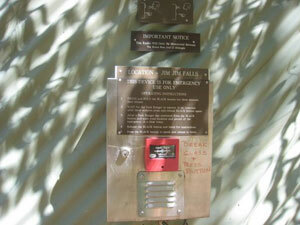 An emergency radio is available at the carpark, which is monitored daily by Park staff from 0630 to 2230. It can be used in emergency situations to request medical help, or a search and rescue operation, or to notify park staff of any other incident where an urgent response is required. Carry a topographic map and compass, or a GPS. Camping permit required. This walk follows the Motor Car Falls walk to Motor Car Falls. Then an unmarked section follows Motor Car Creek downstream to a series of lower falls. The adventurous may continue along the creek to the South Alligator River. Estuarine (saltwater) crocodiles live in the river so do not swim there. Return the way you came. This walk is most enjoyable in the wet season. Motorcar Falls can be reached via the Yirrmikmik Walk. The walk takes you through woodlands peppered with termite mounds and is approximately 7.5 km. Motor car falls was named in 1946 when the first vehicle to drive into the area, reached the creek and could not pass through. A bridge has since been built. 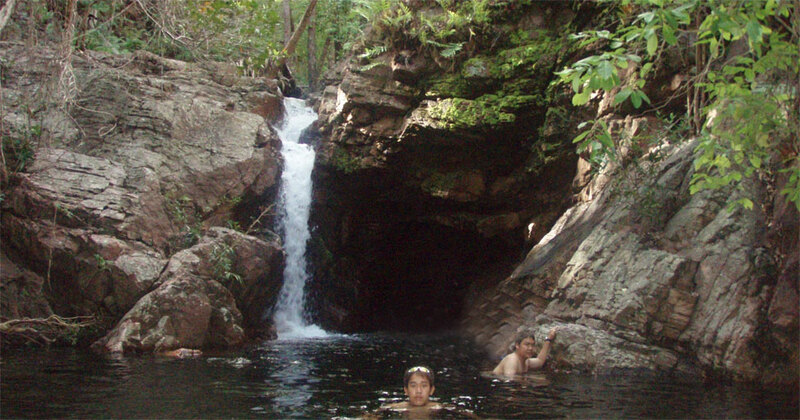 Moline Rockhole is a little known, but beautiful, small waterfall and rockhole just several kilometres from Goymarr Tourist Park . Goymarr Tourist Park is in the process of developing a walking track between the Tourist Park and Moline. It is not signposted so you will need to ask directions at the Visitor Information Centre. Moline offers safe swimming for much of the year but you must first check Visitor Information Centre that's our advice. Kurundie Falls is located approximately 2km from Motor Car falls and is also accessable along the Yirrmikmik Walk. Kurundie often attracts less visitors as many people do not take the time to walk the extra distance. Carry a topographic map and compass, or a GPS. Camping permit required. 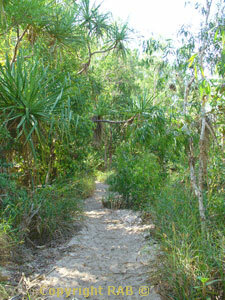 Follow the old vehicle track past Yurmikmik Lookout to Kurrundie Creek, then follow the creek upstream to Kurrundie Falls. At this spectacular place you may see ngalmirla-mirla (peregrine falcon) flying from the cliffs. Also keep an eye out for barrk (black wallaroo) amongst the rocks. Follow the creek downstream through more falls to the South Alligator River. Estuarine (saltwater) crocodiles live in the river so do not swim there. Return to the carpark by following Motor Car Creek to the old bridge and vehicle track. Plum Tree Creek near the start of this walk is just a sandy creek bed during the dry season. It is named after mindu, the billygoat plum. Birn-birndok (striated pardalotes) and wirrirtwirrirt (rainbow bee-eaters) nest in the banks of this creek. After passing through open woodland the track leads to Boulder Creek, which is lined with a monsoon forest. Amongst the boulders are Garnbayn (fan palms). Listen and look for birds, like bukbuk (pheasant coucal). Feel the texture of the large sandstone and conglomerate boulders along the creek. Millions of years ago, the fine-grained sandstone was deposited as sand and silt under slow moving water. Pebbly conglomerates were laid down in fast flood waters. Follow the markers over the boulders across the creek and back to the carpark, or detour to the Yurmikmik Lookout. This walk goes through open woodland up a stony ridge to the lookout where you can enjoy views over Jawoyn country. To the north and west are the southern ridges of Kakadu. The large sandstone hill to the northwest is Bornluk. 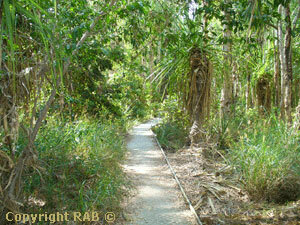 Look along the road for the lush ribbon of vegetation growing along the South Alligator River. To the south is the high flat country of the Marrawal Plateau. Marrawal refers to the seasonally swampy uplands between the South Alligator River and the Katherine River. The trees at the lookout with yellow-green bark are dirringgil (gardenia). Mungguy eat their fruits and use the resin as glue. Smell the fragrant flowers in the dry season. Gubara is a selective destination for a full day of relaxation. The quaint 6 km trail ends at rock pools. During the wet season these pools are connected by a series of smaller flowing cascades. Water Monitors are known to have been seen in the area which have become accustomed to humans. Nanguluwur Parking Area turnoff is just 6klm from Nourlangie. Nanguluwur Rock Art Site and Walk is located near Nourlangie Rock in Kakadu National Park. It is a pleasant walk through woodlands leading to a quiet art site with interesting Aboriginal rock art. Burdulba is on the Nourlangie turnoff - check details on oyur visitors guide and also always before at the Bowali Vistor centre.